Sunday night going into Monday morning was the worst experience I have ever had with Mika. It was pouring at night and there was a thunder storm. It didn't really hit until about 4 o'clock in the morning. I woke to a little bit of rumble, but it was nothing dramatic... yet. A loud boom went off, followed by distant roars of thunder and flashes of lightning. Car alarms went off, my bedroom shook and Mika startled from her sweet puppy dreams jumped up and started barking. She wasn't going to go back to sleep. No way, not after that. I tried to soothe her to let her know that everything would be okay. She jumped off the bed and started patrolling the room, pacing back and forth. After a few minutes I no longer heard her walking around the bedroom. I called out to her and didn't get a response. I sit up and turn on the light on my nightstand, looking around the room for her while my eyes adjust to the light. 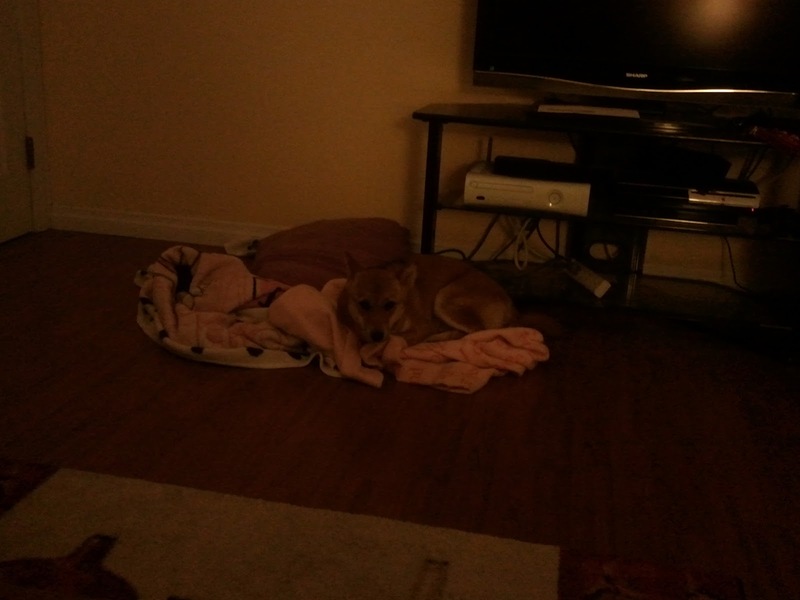 On the floor, laying next to two blankets and a pillow, she was trembling. The storm was still relentless and Mika never experiencing a storm before had no idea what was going on, all she could do was lay there and let her body shake involuntarily. I got up out of bed, picked her up and put her back on the bed, she curled up next to me and I kept petting her until she fell asleep. This isn't a very clear picture since it was taken from my phone in the middle of the night, but here she is before I brought her back onto the bed. How do you doggy parents deal with things such as thunder storms when your beloved pet is scared? Poor Mika. My spotted sister is afraid of the thunderstorms. She would tremble & pace around the house until it stops. My hoomies used to comfort her during the thunderstorms but that was just encouraging her to be MORE afraid of it. It was not helping. So now they just let her be on her own. She's usually fine after it's all over. My moms lhasa apso is terrified of thunder and fireworks. On nights it is storming I used to go track him down (normally hiding in a corner of the basement), bring him to my bed a little under the covers and just pet him until he fell asleep. After I did that once or twice he would hunt me out during storms.